Nerissa's Life: Nerissa the Cat Day! Do you know what day tomorrow is? Tomorrow is Nerissa the Cat Day. It's true. I have my very own holiday now. What's that Peepers? Nerissa the Cat Day is not an official holiday? What do you mean it's not an official holiday? I have it marked on the calendar and everythin'. MOUSES! Well let me tell you somethin', when I'm appointed to the Canadian Senate, I'm gonna have to do somethin' about that. In the meantime, we'll just assume it's a done deal, okay? Okay. Glad we have that settled. Yup, it's a long weekend here in Canada. At least it's a long weekend for most of Canada and definitely here in Nova Scotia unless, of course, you happen to work in a store that's not closin' for the day. Kind of confusin', to be honest. Anywho... The first Monday of August is a holiday, givin' us a long weekend. In fact, some people refer to it as the 'August Long Weekend.' Kind of a silly name for a holiday, if you ask me, especially since it's not always in August. Oh sure, the actual holiday Monday is in August but sometimes the weekend isn't. For this year it is, but in years when the first Monday of August falls on the first or second of the month, the August Long Weekend seeps into July. Seeps into July like a leaky pipe in a floodin' basement. Are you beginnin' to see the problem at paw? How can you call it the August Long Weekend when one or two thirds of it are sometimes in an entirely different month? MOUSES! In places where peeps, havin' recognised this all-too-obvious calendar seepage issue, don't want to call the holiday the August Long Weekend but don't have anythin' better to call it, it's known as the Civic Holiday. Kind of just a general, run of the mill name, I guess. Somethin' to call it for lack of a better somethin', I suppose. Kind of blah, bleh and borin', in this cat's opinion, but maybe that's just me. As the holiday is supposed to be about celebratin' the birthdays of the provinces, Nova Scotia and Prince Edward Island call it Natal Day. Other provinces have given it names such as Saskatchewan Day, British Columbia Day and New Brunswick Day. You know... names celebratin' birthdays and provinces and whatnot. But truth be told, places call this holiday Monday all sorts of things. Now here is where it gets really confusin'. In parts of Ontario, it's called the Civic Holiday but in Toronto, they call it Simcoe Day. In Ottawa, Colonel By Day. In Burlington, Joseph Brant Day. Benjamin Vaughan Day, George Hamilton Day, James Cockburn Day, Founder's Day, Peter Robinson Day... The list goes on and on and yes, on. MOUSES! I read somewhere that cities can call the day whatever they like. What about towns? What about villages? How 'bout places so small they're really just dots on a map? I, myself, live in one such dot on a map. It's so small, we don't even have our own postal code. MOUSES! Well let me tell you somethin', when I'm appointed to the Canadian Senate, I'm gonna have to do somethin' about that. But back to the map. It appears to me that cities are callin' the holiday Monday all sorts of things, generally namin' it after peeps who have made some sort of historical contribution to their cities which really, are just bigger dots on the very same map. The size of the dots really shouldn't matter. If big dots get to name the day, little dots should get to, too. You know? Of course you do. And why should those names be limited to peeps? I mean... WHY? That's speciest, that is. It's speciest, for sure. I think it's fair to say that I'm a fairly well-known cat livin' here in Nova Scotia. Of course, there are other popular cats. Stan... Earl Grey... The cats at Mickey's Musings... All, very well known. Perhaps even better known than I. But here in the valley, I don't know of a lot of other bloggin' kitties. Actually, I don't know of any. Plus, there's my work with eggbeater-whisk teleportation-time travelling technology. My brother Seville and I are leadin' experts in the field. We're the leadin' experts in the whole wide world. And then there's my possible - if not probable - Senate appointment. Bein' the first feline Canadian Senator will be a pretty big deal, I should think. My gosh... Having taken all of this into account, can you think of a better name for tomorrow? I doubt it. Nerissa the Cat Day is the best name ever, for sure. 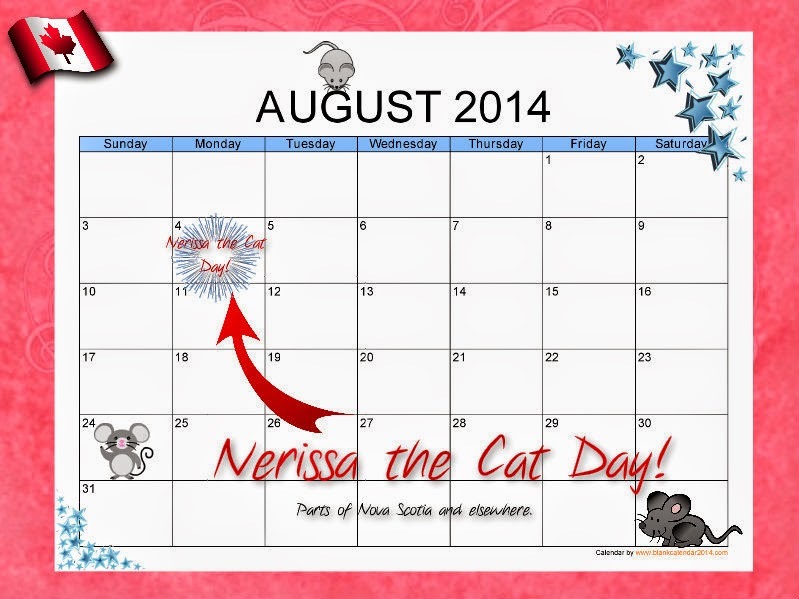 So anywho... At my house, the calendars all say that tomorrow is Nerissa the Cat Day. Eventually, such calendars shall spread across this fair province, being found in every kitchen from Yarmouth to Cape Breton Island. And who knows, other provinces may pick up on the name, too. Bet they will. Bet they won't be able to resist. After all, could you? Well Nerissa, you go for it. I like your style. Happy cat day to you!! You gonna have lots to do once you get your senate job. I need nap just thinking about that. Humans tend to be messy beings. So ….They are lucky they have us. I think that all the days have to be … cat’s days ! And you really deserve to have one just for you. August 4th is your day. Happy Nerissa the Cat Day ! Nerissa the Cat Day sounds great to me! I so agree about that species prejudice. Speciests indeed! I'm all ready to celebrate tomorrow! p.s. I'm off to vote. I'm so sorry I missed this before. 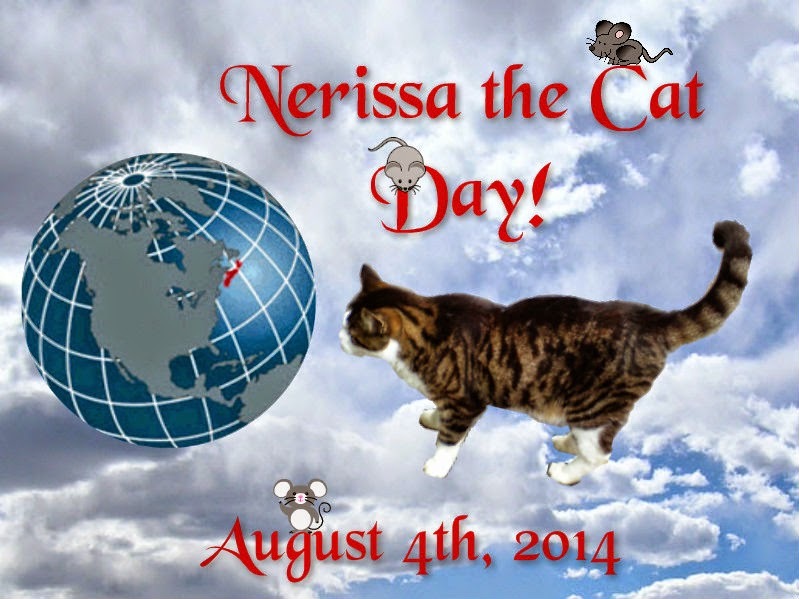 I think that Nerissa the Cat Day could go international! I think Nerissa the Cat Day sounds pretty good to me! Wishing you all the best on Nerissa Cat Day! Please become a senator, you will be far more honest then many who currently have the title. We wish you a Happy Nerissa the Cat Day! We look forward to you being appointed to the Senate. Nissy, we think you've got a great platform for your senate run. The Island Cats are right, once you are in office, you'll be able to straighten this holiday mess out once and for all. We think Nerissa the Cat Day would be the bestest holiday ever. Good luck with the Senate! Well. Another reason to celebrate...and move up North! Oh yeah, decreeing this day Nerissa the Cat day would SO simplify things! If humans were smart, they would jump on this idea and run with it. I live on a dot on the map too! Here in Ontario, we are just outside of Ottawa. Not even a spot....a speck really. Its crazy how our holidays are called so many different things! I definitely think it should be Nerissa the Cat Day. All the other choices just aren't as catchy! have a superb day! Sounds very confusing! Good job you have the day off to deal with all the confusion at to what the day actually is!! I'm all for celebrating Nissy Day! We think the Nerissa the Cat Day makes the most sense. The others are such a mouthful and so confusing we can't even remember ONE after having just read them! Hope you had a fantastic Nerissa the Cat Day! Oh no! We missed it... we'll have to keep celebrating anyway. Does Hallmark know about the new holiday? thanks for stepping by! happy belated nerissa day, happy noms day! We had a great "Nerissa the Cat Day" and totally relaxed and chillaxed! 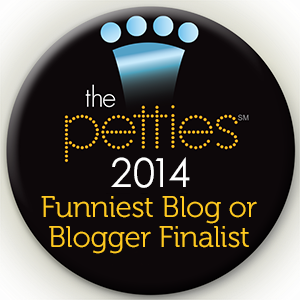 You get our vote for sure...hope your day was good too!